Smart Forms bring consistency throughout the site, as well as a high degree of sophistication in user input forms. Data is always validated, with the user being given the opportunity to correct items they are able to correct. More serious errors are reported in a friendly manner to the user and in detail to the system administrator. Integrated callouts provide help on a per-field basis. 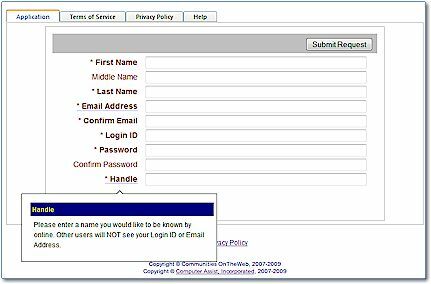 Tabs can be used to simplify complext forms, as well as providing help and additional information for the user.